Interest in American modern jazz has flourished in Japan, which is home to some of Blue Note’s most avid vintage collectors. Much original vinyl is found in Tokyo’s record stores and online sellers, and some observers have suggested that as much as three quarters of US collectable jazz records are currently located in Japan. Back in 1970s America, as interest in jazz was waning , it did not escape United Artist’s attention that there was huge potential interest in Blue Note in Japan. The opportunity was taken to reissue much of the Blue Note catalogue through licensing agreements with local record manufacturers and distributors, and other US jazz label owners soon followed suit with their own licensing programmes and partners. 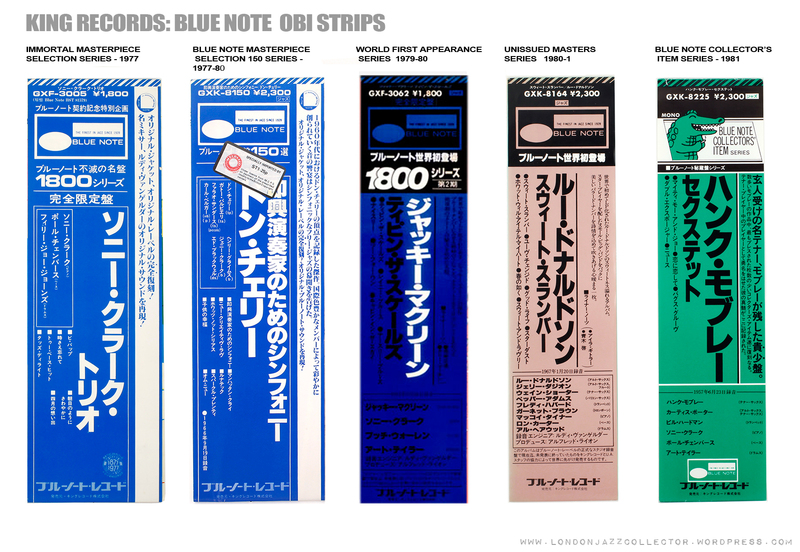 The issue of Blue Note records in Japan parallels the history of the Blue Note label. Between 1966 and 1977, selected titles from the Blue Note catalogue were re-issued in Japan under license through EMI-Toshiba on the “Liberty label” (after 1970 United Artists owned both Blue Note and Liberty Records Inc), then in partnership with King Records, Tokyo (1977-83). Finally, after 1983, EMI/Capitol, moved production back to their own subsidiary in Japan, Toshiba-EMI (1983 to present day). Many of these “vintage” Japanese reissues are found in American and European collector circles today. They offer a reasonable quality affordable vinyl of otherwise unaffordable and rare titles in the 1500 series and the later 4000 series, and some titles contain material not released elsewhere. Though famed for their engineering quality, Japanese reissues are, in general, sonically more restrained, and tend to lack the bite and punch of Blue Note originals and early Liberty reissues. Often titles were released only in stereo, in some cases from Van Gelder twin track tapes never intended for stereo. King faithfully reissued some mono-only titles and thankfully no “fake stereo” was created through electronic reprocessing. Modern Toshiba vinyl reissues are not of the same standard as earlier vintage ones. The real advantage of Japanese reissues is possibly the care which Japanese owners took of their records: home hi-fi with light 2gm tracking weight cartridges rather than original ’50s-60s radiograms with 20 gram weight tracking arms, a worn or chipped stylus, unstable portable record players, and one careless owner, all of which took a heavy toll on vinyl condition. In 1976-7 the Blue Note and Liberty trademarks belonged to United Artists, who licensed Toshiba-EMI to use them in Japan. These mid-’70s EMI-Toshiba pressings, the LNJ and NR series, should not be confused with the later Toshiba reissues from 1983 onwards, which date from the time when Blue Note came under the ownership of EMI/Capitol. The early Toshiba series are, by a significate margin, the best ever Blue Note pressings to originate in Japan. Not a statement I make lightly. 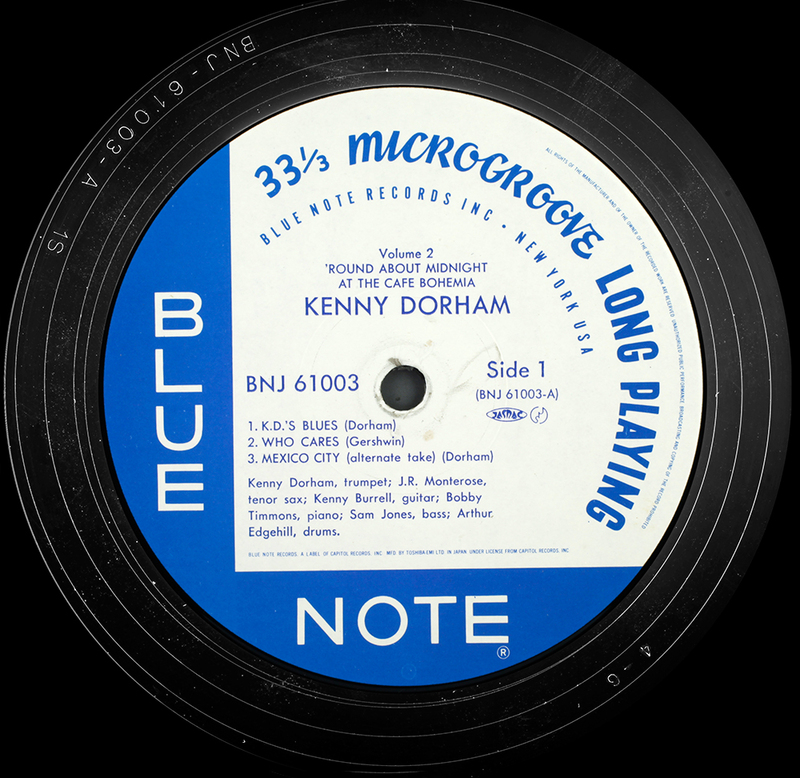 Instead of adopting a facsimile of the original Blue Note edition label (as did King and later Toshiba), the early EMI-Toshiba series used an anachronistic ” A DIVISION OF LIBERTY RECORDS, INC.” text where the address would normally be. The reissue transfer quality is outstanding on the few I have. 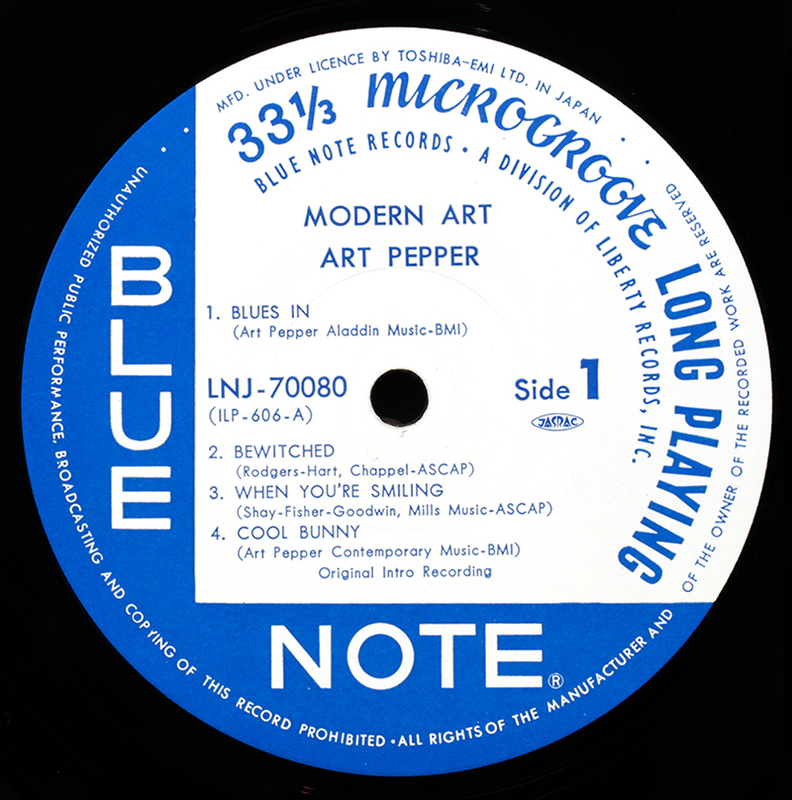 An example below of United Artists using EMI-Toshiba as a vehicle to release other United Artists-owned recordings in Japan on Blue Note labels- in this case Art Pepper’s Modern Art. This Pepper recording was made originally in Hollywood in 1953 for the Intro label, one of a suite of jazz sub-labels owned by the Meisner brothers Aladdin records. The Meisners sold Aladdin to Imperial Records around 1961. Imperial was bought by Liberty Records in 1964, who two years later went on to buy Blue Note Records. In 1968 Liberty Records (including its Blue Note and Imperial catalogue) was acquired by a financial conglomerate, Transamerica, who also owned United Artists Records. In the early ’70s, Transamerica consolidated all their record companies holdings under United Artists leadership. So Art’s Intro recording was published in Japan by EMI-Toshiba under United Artists license using UA-owned Blue Note and Liberty trademarks. Simples! In 1977 the financially pressured United Artists Music and Record Group moved its Japanese licensing progamme from EMI-Toshiba to King Records. This included the reissue not only of Blue Note recordings, but also other material that had come into possession of United Artists, such as Transition, Jazz West, Pacific Jazz and Contemporary. Tokyo dealers who specialise in selling Japanese Blue Note pressings say King are becoming particularly hard to find, originating from a dwindling numbers Japanese collections. They sell inexpensive Japanese reissues to US and European collectors, while in the opposite direction Japanese collectors fight over fiercely expensive US originals. 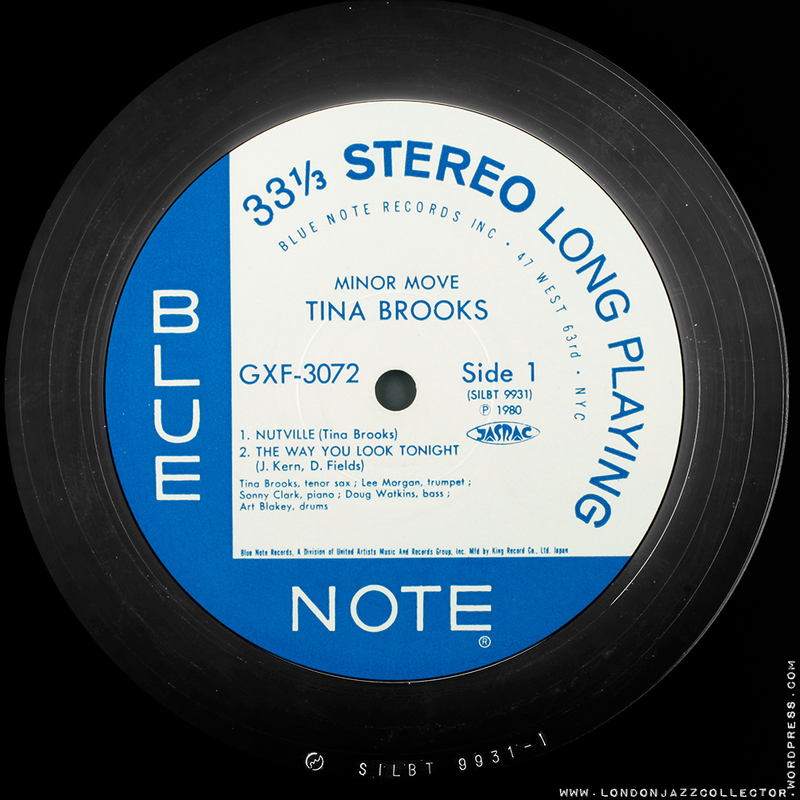 King Records issued around 400 Blue Note recordings up to BLP 4363 in the six years to 1983, a quarter in mono and the remaining three quarters in stereo only, few if any in a choice of format. King selectively also released some previously unpublished material in its “First World Appearance” and “Unissued Masters” series, (some of which eventually appeared in US/Europe in the rather anaemic Blue Note LT series). 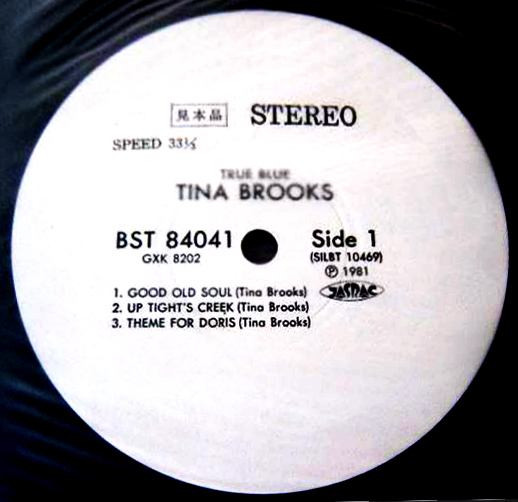 The reissue programme consisted of a series of thematic releases in addition to various catalogue selections and special celebratory releases, such as the ” Special Replica 15 ” series. 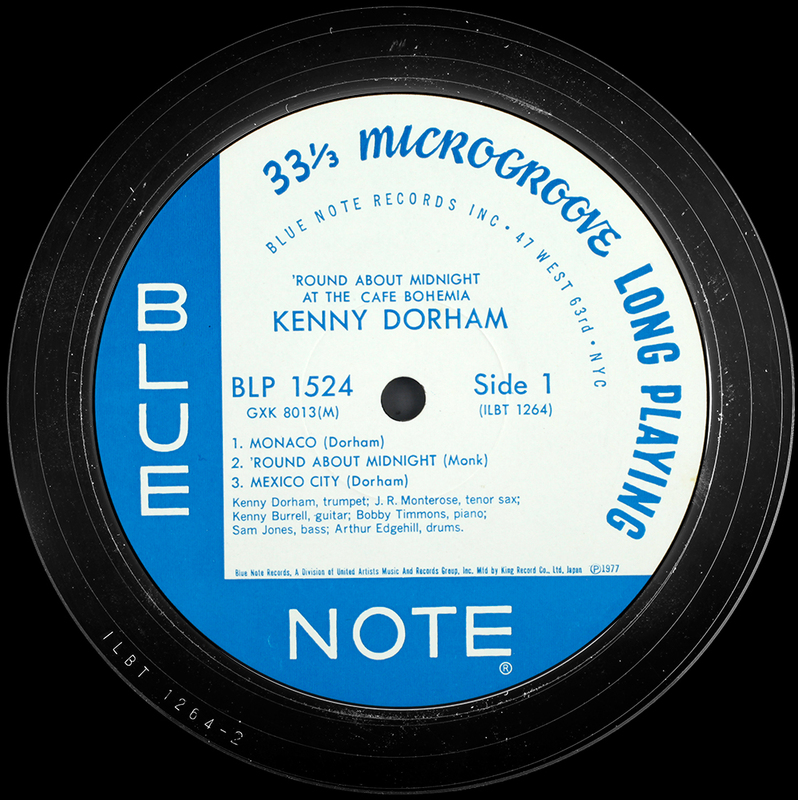 For a number of Blue Note artists – those whose records are both extremely rare and expensive, like Hank Mobley, Sonny Clark and Lee Morgan, – the cash-strapped vintage vinyl lover should look to King as the preferred alternative, alongside early Liberty reissues and 70s Toshiba-EMI, though which of the three offers the most satisfying audio presentation can vary from title to title. Realisically, Japanese pressings are not collectable in the same way as original Blue Note: collector lust demands that such things be all-but unobtainable. Each King series had its own distinctive obi-strip, probably more informative to the Japanese-speaker, however many obis were lost or discarded over the passage of time. 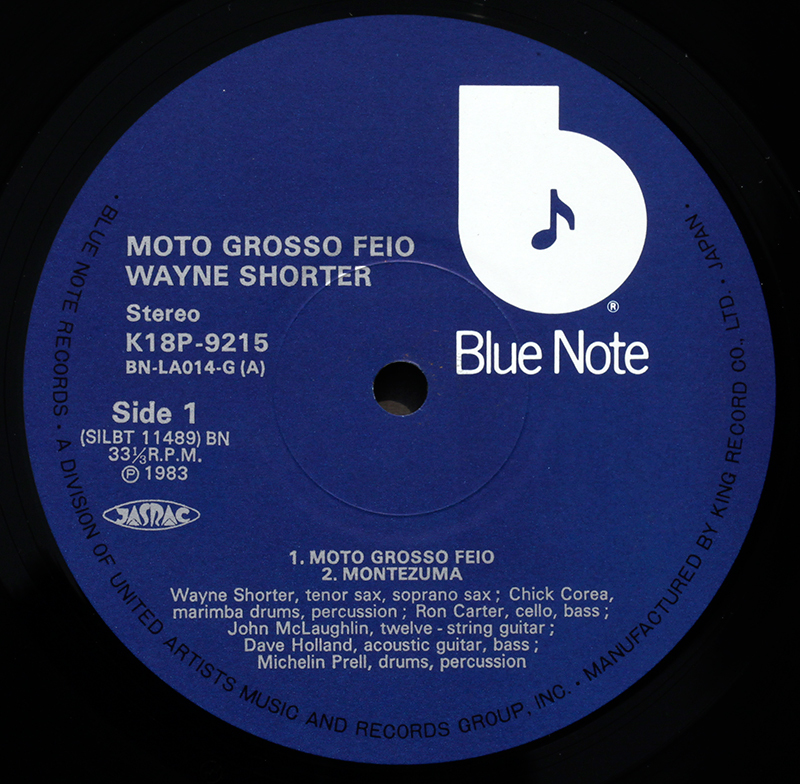 The final series of reissues released in 1983, well into the period of EMI ownership, was King’s “Blue Note Masterpiece series” (not to be confused with the earlier 150 titles called “Masterpiece 150 “), consisting of around seventy five titles, with fifteen singled out for the Special Replica 15 series, the crème of the Blue Note catalogue given replica vintage packaging – and a 30% price premium. “Factory Sample” is what the three Japanese letter stamp means, I am reliably informed. Japanese is like a foreign language to me. I can see the first letter is a drawing of a factory, with a long approach road leading up to it where the top executives can park their company cars. The middle character represents a set of scales weighted to one side, indicating weighing and critically judging differences. The last character seems to represent a batch production run of boxed products. There, you didn’t know I could read Japanese did you, or it illustrates the fearsome but fallacious power of post-hoc reasoning. King Record Co., classic cream/blue label , test pressing stamp, P 1977, one of the first King reissues starting with the earliest 12″ 1500 series BLP 1501. P 1981, JASRAC royalty collection agency logo, speed 33 1/3. Available from Ebay sellers in Japan priced mostly between $50 and $100, the white label are thought to be more desirable because of the probability of being among the first pressings off the stampers in production, though with reissues, this is a less important than with originals. King pressings are rarely disappointing, and carry a slight collector price premium over the later 1980’s Toshiba-EMI pressings.Claimed by some enthusiasts to be the best pressings originating from Japan, and preferred to United Artists own US reissues.I should emphasise I don’t consider any of them the equal of either original pre-1966 Blue Note or the first wave of Liberty/NY Blue Notes. It has been said these pressings were made from masters created by a Japanese engineer flown to the US and given access to the Blue Note vaults and original tapes. It is more likely that Japan was sent copy tapes, as was custom and practice in all other branches of the music industry. Truth is lost in the mists of time. The replica exhibits all the usual King pressing plant symbols. It looks like a standard production run, albeit on thicker vinyl, which has no effect on the sound. I would hazard nothing has been done with the sound except a generous sprinkling of marketing hype (like King could say to the engineers: Hey guys, special job, make this one sound better than usual, you know, “like the original”. If only). As with all King pressings, the audio quality is very good but falls short of the original pressing, which I eventually added to my collection, though nice to have both feisty mono and silky stereo. The King Replica (left) original (right) – missed opportunity – no ear. Also not uncommon, lack of colour fidelity, overplaying yellow to create a cream tint results in blue tilted towards green. Example of title found only in Japanese editions. Perhaps this is something more of us would like to play – if we knew where to get it. 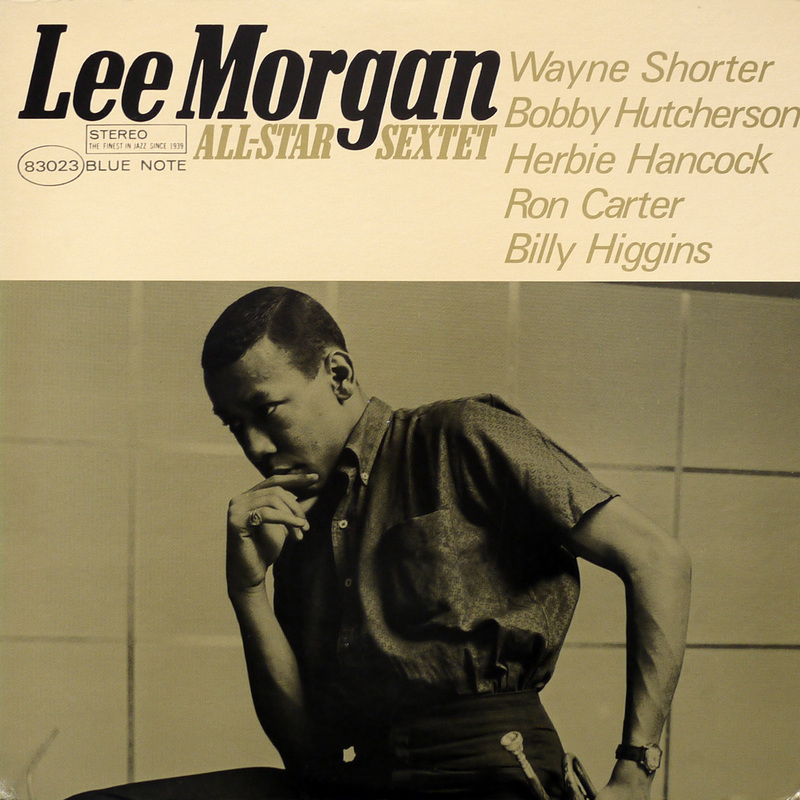 Lee Morgan, Sonny Clark, Grant Green feature heavily on the agenda of Japanese jazz enthusiasts. It’s enough to make you want to move to Japan. Note catalogue number 83023 is pure local invention. 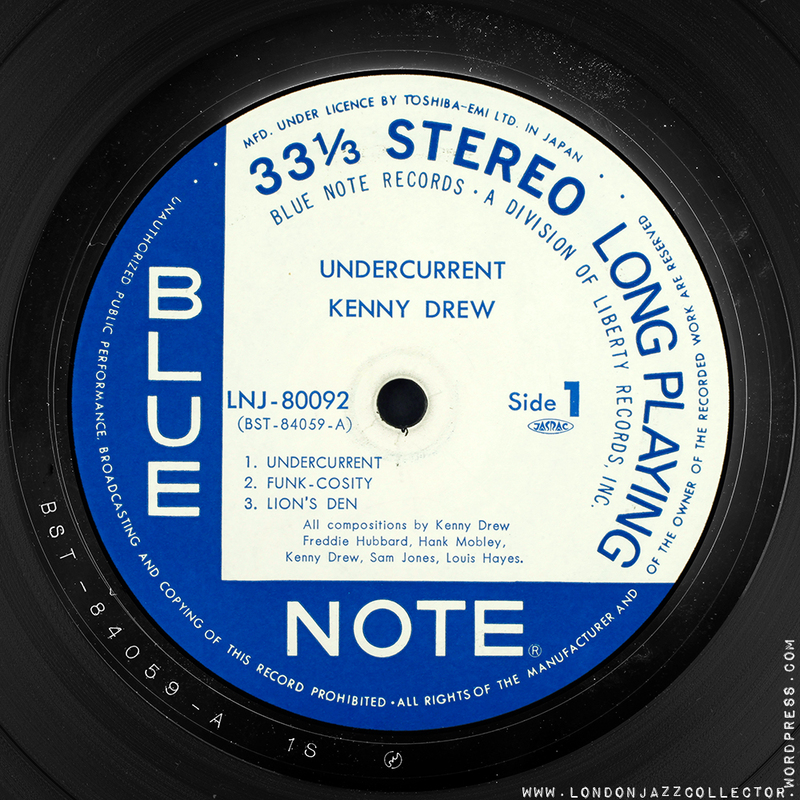 A dozen or so Blue Note titles were reissued with facsimile United Artists Blue label/white b, no irony intended, as the blue label is not considered collectable today. Note addition of not one but two guitarists to the ensemble. Musical jazz fusion waves. 3. Toshiba-EMI years, later series, 1983 to present day. A change of Blue Note ownership back in the US in around 1980, change of licensee in Japan in 1983. Out goes King, in comes captive subsidiary Toshiba-EMI. For new owners of Blue Note catalogue in 1980, EMI-owned Capitol Records saw Japan was a still vibrant jazz market for Blue Note, and its Japanese subsidiary, Toshiba-EMI embarked on a reissue programme to match that of King Records a decade earlier. Though sometimes not as dynamic as pressings by King, later Toshiba EMI series pressings are often preferable to later US and French reissues, though neither stand up well against original Blue Note. Lowering the record arm, their silent vinyl can itself be a pleasure after listening to hours of clicks and pops on well-used American vinyl. Modern Toshiba (manufactured after 1994/5) are not the “legendary quality” of the pressings of its early years. The ’70s, early-80s through to the early-90s pressings are generally very high quality, with just a few duds, possibly due to a poor copy source. From the mid-90s however, solid-state equipment and digital production methods took their toll. Van Gelder was brought in to remaster recordings for CD (not for vinyl!) By the opening years of the following decade industry cynicism plumbed new depths, with examples of CD files copied onto vinyl, resulting in sonically empty pressings. 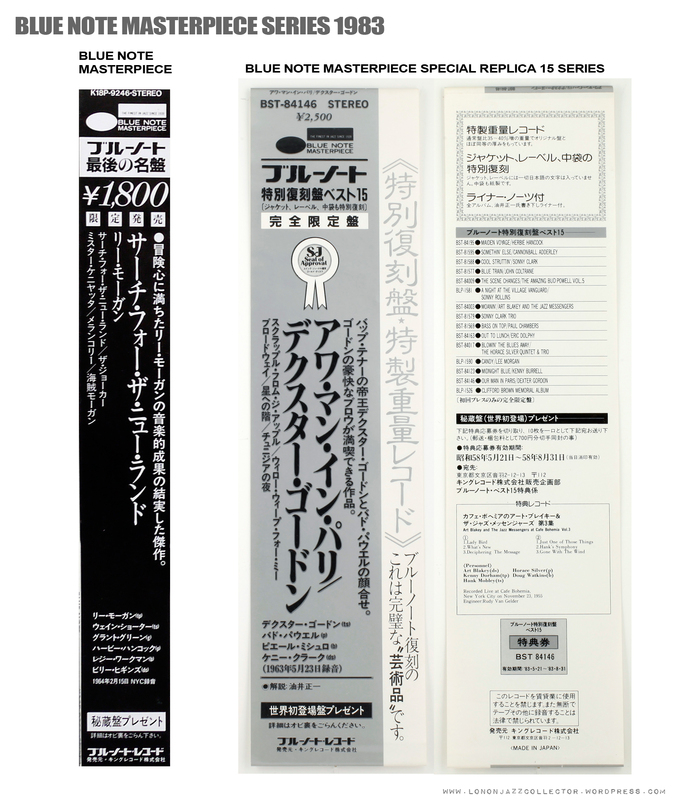 Much of the Blue Note catalogue went on to be released a second or third time in Japan, and it is always advisable to check the year of manufacture of any particular issue. Earlier editions are generally preferable to later ones. Ateliers Sawano, Tokyo, lead a wave of hyper-authentic replicas, complete with heavy cardboard sleeves, artwork printed with antique presses, even manufactured with Deep Groove, and I am told, a Plastylite cursive “P”. Claims are made that the records are mastered from the original tapes, though that is true of every record. One Sawano I bought I sent back as the quality was shocking. Not from original tapes (lost or destroyed) it had been cloned from old vinyl with some electronic trickery to remove the surface defects. To my mind a copy is still a copy, however good a copy, it is not the real deal. However if you want Mobley 1568 or some Cool Struttin’ you might feel the compromise is worth considering. Love the 47 West 63rd address and no INC or R, but oh that deep groove looks like its been cut into the vinyl instead of pressed, with the result the label has been pierced and torn by the sharp edge of the groove. Not ones to give up, the Sawano brothers now produce replicas which claim to have been from the original master tapes. How they came to have access to them remains unclear, and a cynic might remark that every issue or reissue is derived from the original master tapes, just not mastered directly from the original tapes. dear LJC & friends, may I ask which series is this from please? it has the 2163 yen price on the circular obi sticker. I have seen another very similar looking obi sticker which has a rectangular box with more info here https://imgur.com/a/CTGMW3D . 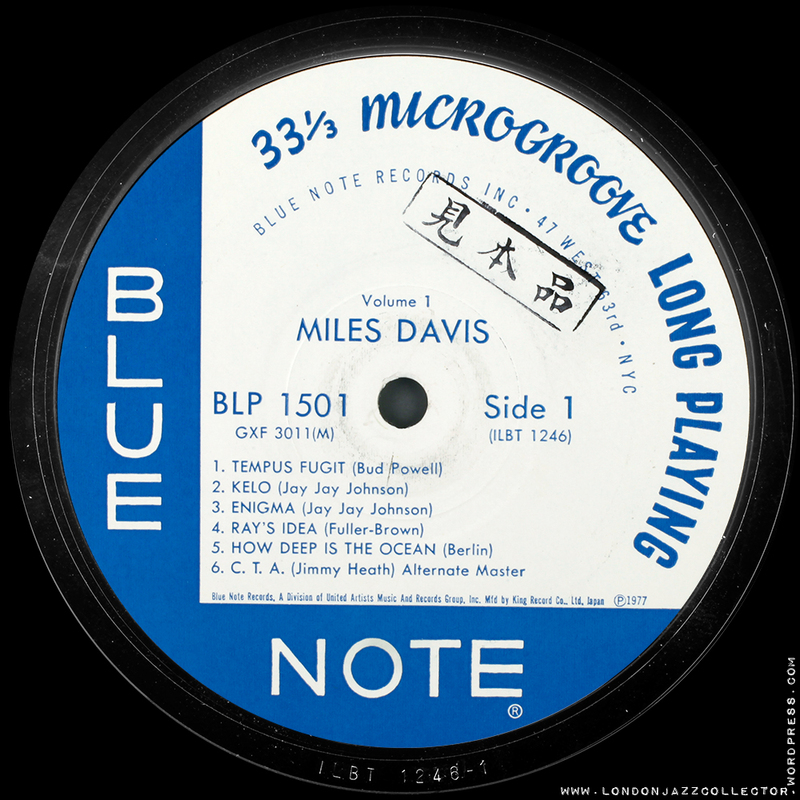 also visited microgroove website and it says Oct. 21, 1984 “Blue Note BLP 1500” Series Part 7. im just wondering. so this was released with 2 different obi stickers? I also noticed an ebay listing where its mentioned that the record was cut using a westrex 3d cutting head https://www.ebay.com/itm/John-Jenkins-with-Kenny-Burrell-Japan-Vinyl-LP-Sealed-Copy-Bluenote-Sonny-Clark-/361424044166. Hi, I wonder if you have some info about that circular symbol with some sort of “w” or “m” in it. I see it in many Japan pressings here (and also in many other titles). One can see it easily on images like the ones from Toshiba-EMI (1966-77) white label promo, or LNJ 80092, or ILBT 1906-1. Yes! That’s it! Thank you so much! Is there a definitive list of all the early Liberty/Toshiba EMI reissues? Hi, Google it, please, the concierge service is on Autumn break. Chico Hamilton’s LP El Chico features guitarist Gabor Szabo and in my opinion captured Gabor’s purest tone. I’d love to learn anything about the session. I too am fasinated by the period (obviously)! In this case, monitoring and mixing are the same thing—to mix the music you need to monitor it and Van Gelder was doing all this with one speaker in Hackensack and for some time at Englewood Cliffs. So what he, Alfred Lion, and the musicians heard through that single speaker was the two channels of music going to his two-track tape machine summed together at equal volumes. Then, when Van Gelder went to cut the mono master lacquer disk later, he would sum the channels together the same way and hear and cut the same thing Alfred Lion and the musicians would have heard in the studio during the recording session. You’re right: true stereo can’t come from a mono recording though you can certainly sum two signals into one to make a mono recording. It’s also true that Van Gelder was technically summing two channels of a two-track tape to make a mono record with the 50/50 system. I just don’t like the word ‘fold-down’ being used to describe this process because I feel it unfairly implies that no care went into the creation of the mono LP. To further clarify, at one point in the Cohen interview Van Gelder encourages us to think of the master tapes more as ‘multitrack tapes’ where the two channels simply need to be summed at equal volumes in order to get the original mono mix. The fascinating thing is in many cases the sessions would have been recorded, mixed, and mastered for mono without Lion or Van Gelder ever even hearing the tape in stereo once! That’s why I say the stereo mixes were ‘unfolded’ from the mono mixes. Thanks again for the info. I understand your diagram regarding the placement of the instruments and I have heard this about Van Gelder before. What I had never heard was that each instrument was individually miked and would love to know where you got that info. Also, we now have access to many of the previously unpublished photos from inside the recording studio. The only microphone that I have seen this far is one placed in front of Grant Greens guitar amp on Idle Moments. One would hope these photos were candid and not staged or maybe the microphones are out of site. It also makes it hard to comprehend why if each instrument had a mike, it is so hard to hear the piano contribution on so many of these records, unless Van Gelder arbitrarily decided to turn them down. For me, it boils down to what sounds best, the instruments involved and in what environment you’re listening to the music in. On a well recorded stereo album, you do have to either listen to it on headphones or be sitting right in the middle of the soundstage and at the right distance or you don’t get the best result and this can be prohibitive or undesirable to some. Thank you for this information. I had just read it when I walked into a Berkeley CA vintage record store and found a KING 1978 release of Sonny Clark Cool Struttin” I would have thought from the immaculate condition that it was a new release. But armed with this info knew what it was exactly! Still cost $40 US but honestly, it is the best sounding Blue Note vinyl I have heard except for a couple of original’s I have. So thank you. I am curious why King released so few mono albums, for the ones where Blue Note albums had both a mono and stereo release. It seems unusual, given the Japanese love for mono that they chose to use stereo. Even albums like Donald Byrd’s “Byrd In Hand” which never had a stereo release in the USA, until Liberty acquired Blue Note, was a stereo release on King. Any and all discussion welcome. Probably because there were no mono tapes after BLP 4003. King used copies of the masters which were all stereo after BLP 4003. I could be wrong, but I think you may have it backwards. During the Music Matters sessions, it was apparently discovered that all of the Rudy Van Gelder recordings were actually made in stereo only. To get the mono versions, they actually backed out the stereo. If you think about it logically, then the mono version would be the inferior, or at least less natural sound. They did a sound comparison during the pressings and all involved preferred the stereo versions. I set up my own experiment on both vinyl and digital copies. (you can get both versions of many albums with Spotify Premium) I preferred the stereo in both situations. Think about it from the studio perspective. If you were lucky enough to be sitting in the studio with Rudy Van Gelder and the musicians you would hear the trumpet coming from the left side of the room and the sax from the right or vice versa. That’s is the way I would prefer to hear the music, as it actually happened, not as it was modified. It appears there are some mixed opinions/interpretations of what was going on during that time. I’m sure RVG could solve the questions but Music Matters have the masters in their possession right now and the stereo recordings started in 1957. From then until the the album you referred to, 4003, they were made in both stereo and mono. After that time, the records were only recorded in stereo and the mono records were made from their stereo siblings. The mono vs. stereo question confronts anyone dealing with reissues of Rudy Van Gelder’s Blue Note masters. If the goal is getting to the essence of the music, we discovered that you cannot take a dogmatic view of this issue. Rudy Van Gelder first began recording Blue Note sessions in stereo in March of 1957. From then until an October 30, 1958 Art Blakey session, Rudy simultaneously ran both mono and stereo session tapes. After that session, Rudy abandoned the practice of running both mono and stereo session tapes and recorded strictly in stereo. 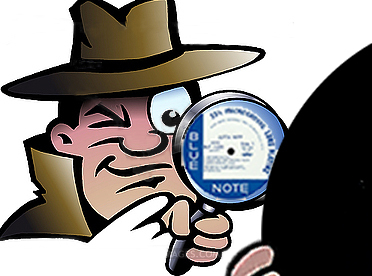 The evidence is there for anyone to see who examines the original master tapes. When Kevin Gray, Ron Rambach and I began our first mastering session with our first six Blue Note masters we couldn’t help noticing the clearly marked (by Alfred Lion) notations indicating “monaural masters made 50/50 from stereo master” on the master tape boxes. But upon delving further into the issue, I discovered that the topic was more complicated than it first seemed. While it’s true that within the 50/50 system the channels of each two-track tape were combined in the same manner as a common “fold-down”, I find the use of the phrase here shortsighted because it typically suggests that a recording was mixed in stereo, not mono. Although it’s easy to understand why so many jazz fans would jump to the same conclusion I did, the irony is that the exact opposite was true with the 50/50 system, and as strange as it may sound, it would be more accurate to say that the stereo masters were “unfolded from the mono mixes”. It would be helpful to get clarification on the matter. Hi, I have no special authority or knowledge in these matters, I’m giving space for other people to study and discuss the subject, seems to arouse a lot of passion. so the views expressed there would seem to be supported by people with some authority. I am aware Ron has taken all or many of the Blue Note master tapes into custody, and if that now puts things in a different light, happy to give space to that conclusion. I would like to commend you on cutting directly to the heart of this issue! The truth is the Music Matters press release is the number one reason I delved so deeply into this issue and took it upon myself to become an expert on it. The paragraph you quoted from my article (I wrote the LJC article you’re quoting) is the most important paragraph in my opinion, especially when it comes to the contrasting statement you also quoted from the Music Matters website. It’s certainly true that a lot of those master tapes are two-track, and it’s true that the mono versions of those recordings were made from those two-track tapes. To prefer the stereo to the mono is also a very valid opinion. The issue I have with the statement on the Music Matters website is that whether or not they had this intention, they are leading people to believe that the albums recorded to two-track tape only were mixed in stereo, but many (if not most or all) of them were actually mixed in mono. The hardest evidence of this comes from Rudy Van Gelder himself, as I quoted in my article. So just because the master tape is two-track doesn’t necessarily mean that an album was mixed in stereo in the studio, and when it comes to Blue Note, in many cases it wasn’t. Thanks so much for your response. I re-read your article and am fascinated by the time period. I had one last question based on your final conclusion and after speaking with Fred and buying his book in New York. You concluded based on quotes from Van Gelder that most of the records were mixed in mono. The way I read and understood the shift in 1959 was that everything was then recorded in two track. Two track by definition (my understanding) is the placement of two microphones in the studio (Stereo) Once the music is recorded (stereo) it would have to mixed in stereo as it was my understanding that you could make mono tapes from stereo but not not vice versa. Could it be that confusion lies in the fact that Van Gelder only like to listen to one speaker in the control room while he was mixing? I may have misread Fred’s quote but I don’t remember Van Gelder saying he only mixed in mono but that he only listened to one speaker in the mixing room. I promise, no more questions. So glad to see my database being utilized, Aaron! One of the key things that I think comes out of that information is that we can see how many albums were recorded to two-track only but then only released in mono originally, and for the rest of the albums during that period that were also released in stereo, the mono version was always released first (I also mention this in my article). This is why my best guess is they focused on mono until around 1962 at the very least, which was when they began releasing the mono and stereo versions of albums at the same time. Hi LJC, i have no idea whether you are still reading this thread, i have over the past 5 years been upgrading some of my favourite BN lps from DMM copies i bought new in the 80’s, I have a genuine obsessive fondness for Herbie Hancock’s Empyrean Isles, among many others. Recently a copy looking like A 67-8 division of Liberty pressing came up for Auction and i ended up winning it for $30.00 US, described as in excellent Condition , only to realize after the fact that one of the photos shows a Japanese insert, all of which appears to contradict the rest of the visual evidence , Neither the LP label or heavy Jacket , has any King or Toshiba Markings , and there appears to be a shallow(ish) deep groove , one wonders what to make of this , perhaps a late 60’s US made pressing destined for the Japanese Market, or a very good later replica? That is most likely the case. Before Toshiba started pressing their own, they just re-packaged US pressings. I have one of those, too. Hi, Toshiba-EMI didn’t start reissuing Japan-made reissues until 1983. King Records pressed Japan Blue Notes 1977-83. Both these carried JASRAC copyright and royalty assertion, which is missing from this sample, so this is likely much earlier origin (unless of course the label is a Japanese facsimile, but that isn’t corroborated by the cover attribution). See comments on SOTISE post. IMO, the pre-king japanese pressings I own do not come close to KING pressings and Toshiba pressings from early post-King era. 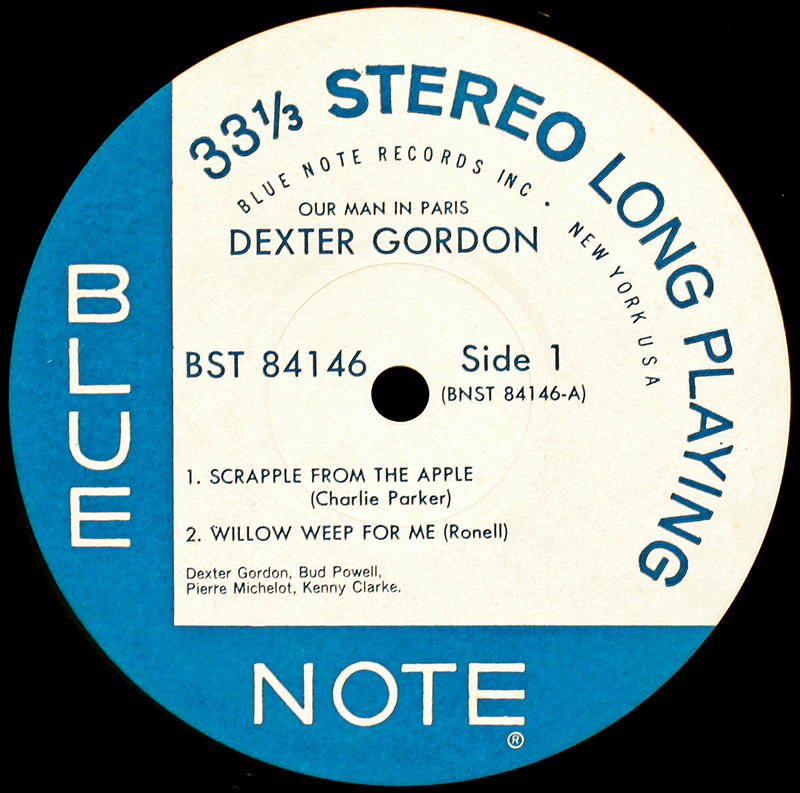 The label is one of the later variations, not the All-Disc/ Keystone Printed Specialties, Scranton PA printing like original Blue Note and continuity early Liberty. Possibly a West Coast pressing. After 1970 we had the Division of United Artists domestic Blue Note label. It wasn’t until 1977 that UA partnered King Records, Tokyo to begin reissuing the Blue Note catalogue. So this looks like a Liberty export to Japan of late Sixties stock US pressing. Possibly the insert holds some missing information. How very very interesting. A scan or sharp photo of the insert would be nice. 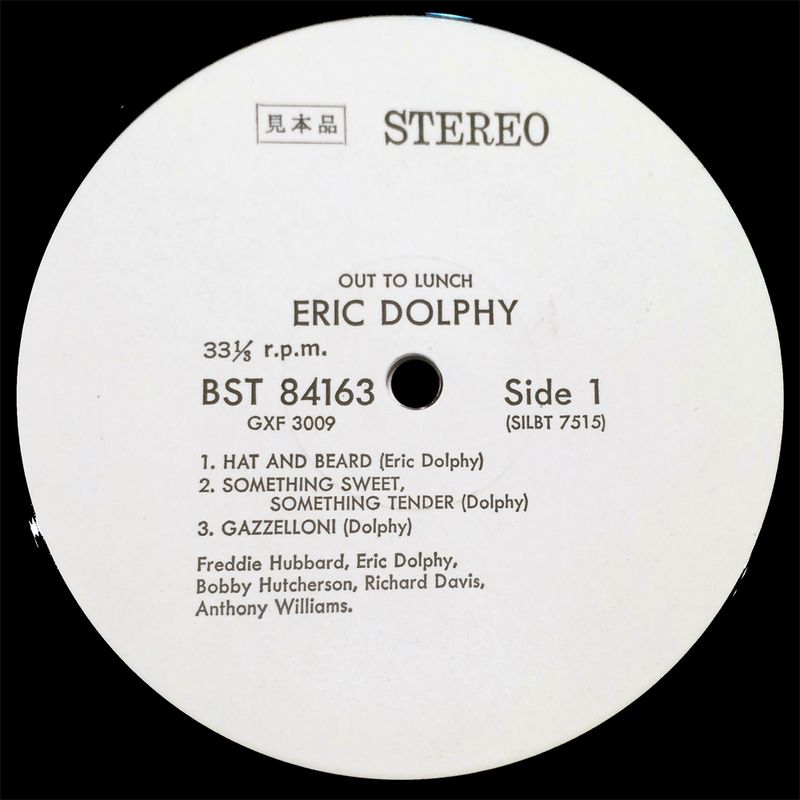 Thanks to both of you for responding , i haven’t received the record yet, but would be happy to post some scans when it does, they wont be as nice as the scans here though… and the inserts are generally not bi-lingual in any case..
the DMM circa 85 of Empyrean Isles is sonically horrendous!.. hopefully this will sound better, in terms of condition one never knows though , some peoples idea of excellent is risible! one more thing i wanted to say , Japanese pressing’s are wonderful and sonically superior and all that ,in great condition that is ,but once they are scuffed i find one notices the clicks and pops which stick out like dogs balls, I’m not really a BN, collector and have but few original mono pressings , and one Sam Rivers-Fuchsia swing song (the most scratched record in my collection) which looks damaged beyond belief, still sounds great with no skips,despite deep gouges and may feelable scratches, a testament to the quality of vinyl and pressing! I have found thin vinyl/ shallow depth of cut as found on some 110-120gm Japanese pressings quite vulnerable in the event of surface damage. In complete contrast, you could drive a tractor over a 220gm Lexington Blue Note and it would still play fine. They say 120gm is all that is required to achieve a good fill, and I am sure that is true from a production point of view, but without regard to the realities of mishandling by previous owners. Some of those OJC reissues are less than 100gm vinyl, and they click and pop if you just look at them. 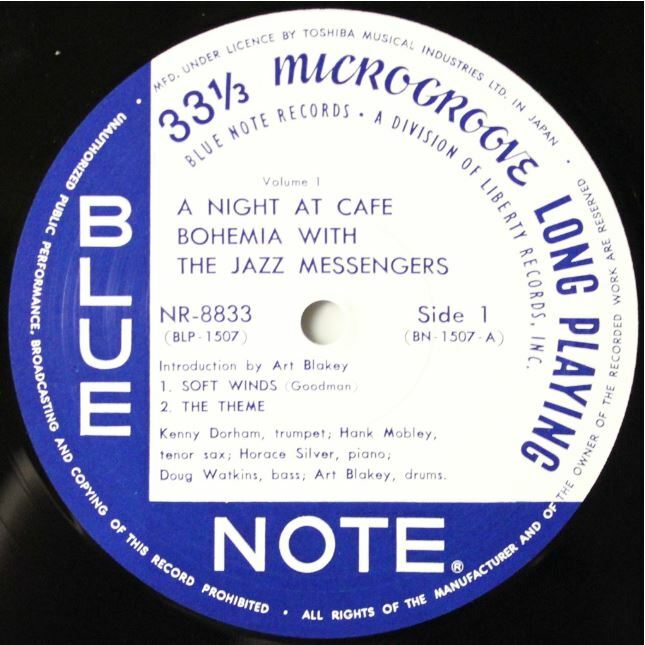 As stated at the wonderful Microgroove website some of the Toshiba EMI reissues came with a thicker coated cover and much thicker vinyl; one example I have is Kenny Dorham’s Cafe Bohemia date. 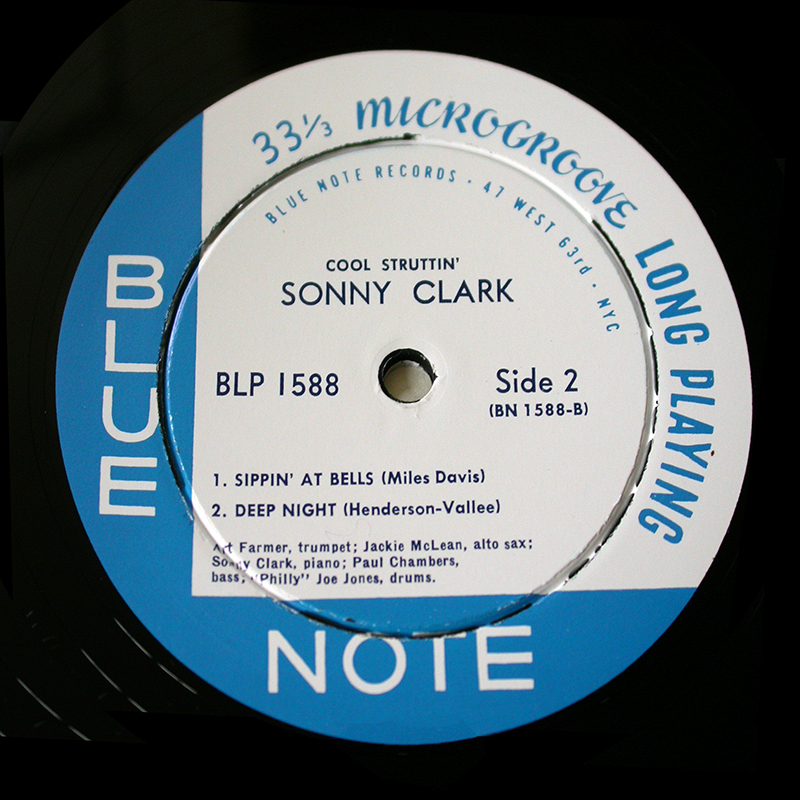 King also made some special replica editions of the 1500 series – I have Sonny Clark Trio. I don’t know whether it’s coincidence or bias but these editions seem superior to the thinner King or Toshiba vinyl. Perhaps in the case of the Toshibas, because they were the earliest pressings. The King replicas are recognisable through the complete lack of any Japanese markings other than the fact they came with an insert. I don’t know how you would identify the Toshibas from an ebay snap other than by the sheen on the cover. I continue to buy Japanese pressings quite happily, where they are an affordable alternative to originals, or where they are the only source, for example the Japan-only releases of some Blue Note recordings. 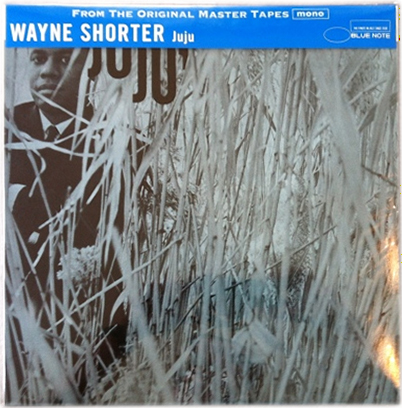 There are a couple of Wayne Shorter recordings from the mid ’60s which King released around 1981 which are very fine-sounding records (and which I will be reviewing shortly). I’m no expert but as I understand it, not all styluses are the same. My Dynavector TKR has a long profile stylus, which I am told sits lower down into the groove than a conventional round-tipped stylus, and is able to better extract information from more of the groove-wall. That’s what the marketing spiel says, no idea how true, but it certainly lifted performance significantly over it’s predecessor, especially when in stereo. Experience trumps explanation every time. I’ve reached a point where I’m not sure explanation adds anything. Things either sounds better or they don’t. The explanation why they sound better may be completely wrong, but it doesn’t stop it sounding better. I agree wholeheartedly regarding the immense importance of sound over explanation. Though being the theory-driven individual I am, let’s be fair here and admit that theory is important when making buying decisions where both products cannot be auditioned…which I find happens a lot. Some of the Toshiba BLP1500 series are 150-155gr and sound imo even better than KING. Unfortunately I own as many minor sounding 120-123gr pressings of that series and it is absolutely impossible to tell them apart (if you buy online). Even the round OBI is the same. IMO the King special replicas look & feel better than common KING´s but the sound quality is the same than lighter pressings. Fortunately all my records are scratchless, so I cannot tell the advantage discussed above. Yes I should have said more clearly that the Toshiba thicker pressings were limited to the first pressings from a given reissue – not sure just how many that amounted to. And yes all the King pressings are pretty good whether light or heavier. This is really a great point, not only in the context of early vs. late pressings, but especially considering longevity of product. It seems an uncharted topic worthy of further debate. Case in point, I listen now to an original pressing of Mile’s Workin’ that looks like the proverbial “truck runneth over” copy. Sounds wonderful, and considering what I paid for it, a valuable lesson learned. By contrast, if I as much sneeze at any of my Toshiba Blue Notes, or wipe them the wrong way, they are doomed for the dust bin. Spot on. My rude awakening was on receipt of a very thin Toshiba which unusually had not been well cared for, surface marks I wouldn’t have expected to be audible, could hardly feel them with a fingertip, but it clicked like a ’50’s radiogram arm had ploughed through, on every rotation. I now see the relationship between vinyl weight and surface marks in a different way. What helps is a long profile stylus, which gets its information from the vinyl wall lower down in the groove which is less open to surface damage. OK. I’ll take your word for it- you’ve certainly earned it, thank you. But hearing that I now need a “long profile stylus” has my eyebrows raised, thinking of bad wife jokes. Since I haven’t looked at my own stylus in quite some time, I may be in for a rude awakening. Hi LJC, are you aware of Toshiba issuing any facsimile deep groove Blue Notes or are Sawano the only Japanese group to attempt that? Thanks very much! 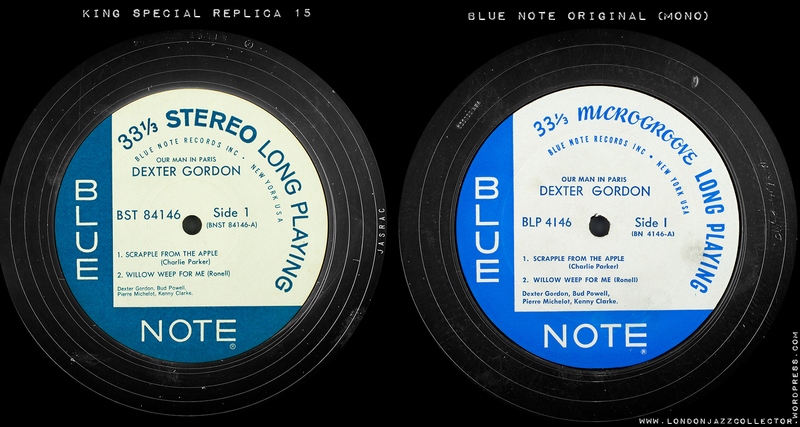 None of the vintage Japanese Blue Note reissues – Toshiba or King – attempted to replicate the deep groove pressing mark. It’s more a modern collector fetish thing. Apart from Sawano Bros, I saw that Chad Kassem’s QRP Quality Record Pressings company – part of Acoustic Sounds – had added a deep groove to one of their 200gm Blue Note reissues. Nice touch. We all seem to be curious about the Japanese. What is their preference by and large regarding mono or stereo? I initially thought mono, but then again, they have reissued so much in stereo when they could have simply folded the stereo tape to make a mono master comparable to Van Gelder’s original mono masters, so if they preferred mono why have they done so many stereo reissues? Also, the whole UA thing going on on the Open Sesame thread is further evidence that they prefer mono. I mean, it seems like United Artists went out of their way to make mono reissues in the 70s when the format was completely dead…makes perfect sense that they did it pretty much just for a demand for them in the Japanese market (thanks Bob). So again, I wonder why all the stereo reissues? Is this series of releases what you refer to in number 6, from Ateliers Tokyo? They basically look like clones/ replicas of deep grove NY issues , right down to the paper folds and print replication. These seem to sell for about $50 to $100. In lieu of finding original or pre Liberty pressings, are these are a recommended option over King or Toshiba pressings ? I must say…I have had very mixed results with King pressings. My GXK copy of Cool Struttin’ sounds really nice but my Freddie Hubbard Goin Up and Horace Silver 1518 both sound fairly dull, not much life in the drums and cymbals. They sound too smooth and soft. However, as another person noted, my GXF copy of Paul Chambers Bass On Top sounds very full and dynamic. I have yet to hear anything that really comes close to an original pressing , when they are not groove worn. I’m listening to my 63rd street Blowin’ The Blues Away and it’s sounds like the band is in my front room!! Any thoughts on these “FROM THE ORIGINAL MASTER TAPES UNIVERSAL MUSIC LLC” releases? Thanks for all the detailed info! Thanks for the info. It’s interesting that despite these being a Kevin Gray – US product , these appear to only be available from Japanese sellers on eBay. I guess I’m wondering if the sonic attention to detail is as focused as the visual attention to detail. 1983, last year of King Records before EMI/Toshiba and they were churning out loads of Special Limited Editions. Never seen anything like these, not even the normal King catalogue number series GXF. King had already reissued these previously so they are basically “normal” King pressings in alternative covers. Got to love those Japanese jazz fanatics. Completely bonkers. Agreed, it does seem pretty crazy – nice artwork though! I forwarded the links to Shaolin, author of the microgroove.jp site which lists all the King and Toshiba releases ever but has no reference to these alternative covers. He’s not got back yet, still in a state of shock no doubt. The first run of King records (the limited run in late 70s..) Blue Note-when they were celebrating releasing the BN catalog for the first time..How would you stack one of those early issues up against a mid/late 60s BN Division of Liberty (w Van Gelder in deadwax).. I had a Toshiba from 80s…Was not thrilled. But 70s King are apparently a step up?? Hi – I have around 50 each of King and Toshiba pressings, and 100 Liberty Blue Notes. In some cases I have a Japanese press a Liberty and finally an original Blue Note as a result of upgrading over the years. I often keep the Japanese because they are usually stereo, in contrast to a mono original. From time to time its fun to A:B:C the same recording. 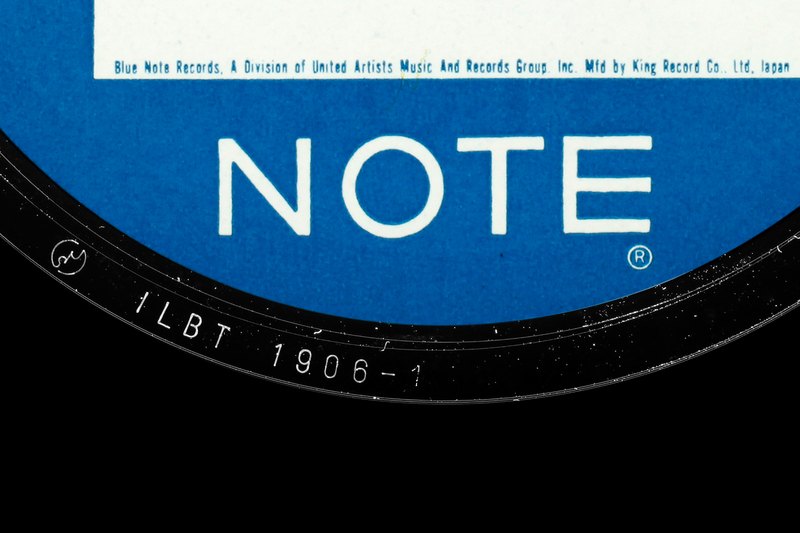 Nothing comes close to original Blue Note – it has never happened. As between Liberty and the Japanese pressings, I much prefer Liberty. They generally have more punch, and a more forward presentation that is closer to the original than Japanese pressings, which are more restrained, though pleasant enough. On the upside, Japanese stereo is good and the vinyl silent and immaculate. My only reservation about Liberty is that the quality deteriorated rapidly between the early years 1966-7 and the Transamerica years 1968-70. Against later Liberty, I would generally prefer the Japanese, and King over Toshiba. The consensus seems to be :King over Toshiba, and earlier Van Gelder stamped Liberty over both..
Also, re. a Mono or Stereo ‘ear’ original Blue Note (or 2nd press..) What steers you one way or the other-specifically say Horace Silver’s early-mid 60s work…. I have Cape Verdean-which I find fabulous, but my stereo press seems very biased toward one channel for saxophone in particular…Just scored a (apparently) NM mono ear copy, so am intrigued and wonder whether I should try for more monos…..
No Van Gelder/RVG stamp where you would expect one is usually a bad sign. It means the house engineer of the day had a crack at the mastering. For Blue Note, even on his rare off days Van Gelder was better than most other engineer’s best. Case in point, I have Rollins 1542 no RVG on Liberty and Div of UA and it’s a lousy transfer. Couple of others are same: no RVG no good. As regards early Blue Note stereo, I generally prefer mono. Riverside for same reason. The instrument placement is often extreme: lead horn far left, second horn far right, piano bass and drums a mix of far right or centre. Often find myself walking up to speakers to check there are no loose wires. I guess I was brought up on modern stereo: I expect the lead instrument to be centre of attention. With Columbia and Contemporary, I tend to prefer stereo. Fred Plaut and Roy Du Nann made a better stereo mix. The one exception is trio’s eg Bill Evans, where the stereo instrument placement is often faultless. It is quartets and quintets when things go awry. Many Blue Note mono’s achieve the seemingly impossible – they fill the room in such a way that you never even think whether it is mono or stereo. Hi! 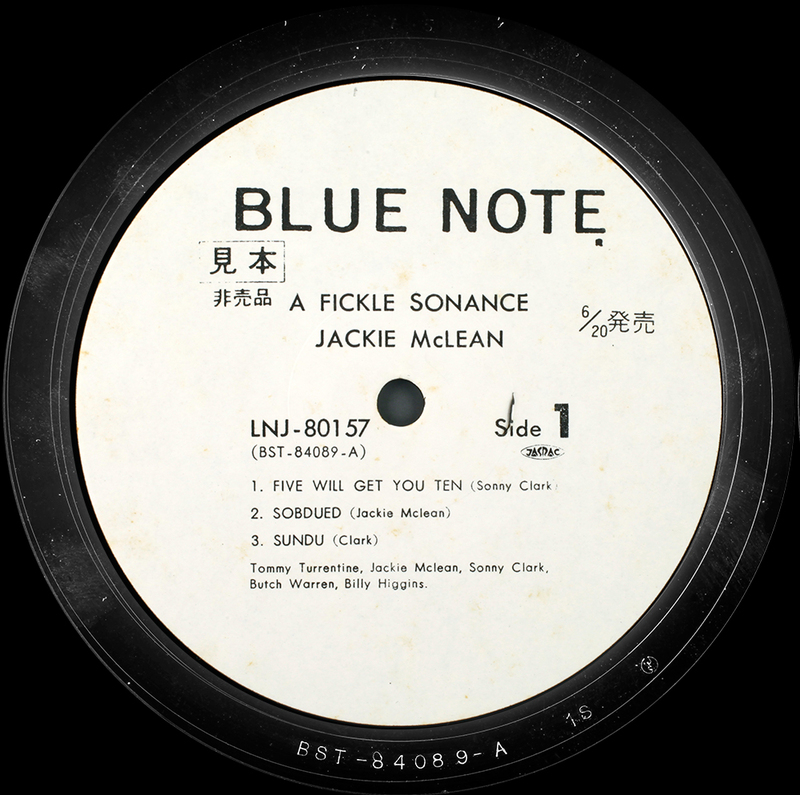 We have found a Japanese Blue Note label which we have never seen before. The blue on the label is darker than in the image above, it’s actually a dark navy blue. Hi! It is from the first run of original Japanese pressings, pressed between 1970 and 1973 by Toshiba. They’re not bad and relatively rare but the later King pressings are generally preferred by most, rightly so in my opinion. Thank you for this great site. I enjoy reading your thoughts on collecting jazz records a lot. The label cheat sheets in particular are pure gold. One thing that bugs me, though… I think you should really credit the main source for your Japan Blue Note listing pages. It would only be fair in my opinion. It was a lot of work to do the research and compile all of this, and since we all rely on his expertise so much, Kohji-san deserves a shout-out, don’t you think? Absolutely right, his documentation of the many Japanese releases of Blue Note is legendary, I would not wish to take any credit for his work. Hi. What do you know about a promo white label sample copy of a king pressing LP?? It has the Japanese ‘sample’ characters on it. Hi – I have added a short note and picture (1.1.1) above on King White label promo. Photo is from Ebay where I found these fairly readily available. I have one at home which I don’t have access to at this time as I am travelling but will update next week with something better. From the one copy I have, they are much like other Japanese pressings – silent vinyl, usually in immaculate condition, better sonically than many other Blue Note reissues eg Blue Label UA, but lack the punch of original plastylite. I would expect a promo to be early in the pressing run, so have the edge over the general issue, but thats conjecture on my part and base on no first hand evidence. Very helpful analysis, thank you! Quick question regarding the modern replicas, specifically the Ateliers Sawano ones. Besides the “cut” DG are there any other ways to identify them? There is one currently in eBay, identified as such, but pretty convincing! Hi, the one Sawano I bought was pretty poor in every respect, but they seem to have upped their game here, and I read elsewhere they had purchased an old 1950’s printing press in order to replicate the look and feel of paper paste up. The photo here of the back of the jacket shows a paper fold shadow-line – looks like it might be a thick card cover, though whether they could pull off the laminated front cover art work remains to be seen, but it looks pretty convincing. You will only know by buying it. The acid test is what it sounds like. From what I have listened to it is virtually impossible to replicate the sound of a Plastylite Blue Note.Did they have access to original tape in the Blue Note Vaults? I doubt. Is the master cut on a Scully, every part valve/analogue, or have they used modern digital transfer from a digital copy to short cut everything? I have no idea. Its more than twice the cost of the usual audiophile 180gm reissue, but the sleeve looks like it might justify some of the extra cost. I might be tempted, for the experience. “Its only money” as they say.It really comes down to whether you crave the real thing, in which case you might do better to tough it out on ebay for a proper copy. If you do decide to go for it, I would love to hear your opinion on it. Hei, thank you very much from Norway for this informative site ! I have learned quite a bit about my favourit record label! Since I own a decent collecting of japanese pressings, I’d like to return some personal opinions I have not been aware seeing on your blog. Particularly comparing King record to Toshiba-EMI: It is true that King record in generally sounds better, but there are some exceptions to the rule: the Blue Note BLP 1500 series from Toshiba just right after the King era (83/84) is superb (if you are able to get hand on the heavy vinyl first pressings)! The BNJ-series from 84 is also great sounding and compete-able with King record. The highlight I posses is the 45rpm Adderley/Hancock split from the DAM special issues (DOR-0129) which I managed to win for 50$. It is the best sounding album I have. I also own some King replica 15 including the one of Hancock. The DAM just sounds ‘live’ in all aspects. That said, I love my Kings. Though they are a bit harsh at times and I find the same album from Music Matters preferable. Personally, I prefer the GXK series and the later GXF to the first issues and most K18P’s. The best replica 15 of the nine I own is IMO Paul Chambers Bass On Top! Thanx again and keep up that enthusiasm! On the whole I prefer the King over the Toshiba but I agree it comes down to the specific record and there are times its the other way around. I have a head to head test in mind when I can get around to it: I have just one record where I have both the Toshiba and King : Mobley 1568 – no surprise, sadly not the original Blue Note ;-( I wonder which will sound better? I own as well one of the 2nd pressings of the Toshiba 1980’s (120gr) Kenny Burrell-blue lights vol.2 which can very much compete with my vol.1 king pressing! The Mobley 1568 I own is Toshiba 90’s (with BN to left on the label)–sounds ok to me, but for example my soul station GXK beats it in every (sound) aspect. As for king record, my impression is that their intention was to replicate as exactly as possible the originals. Contrary to many newer “audiophile” pressing which try to improve or simply smoothen the original sound. Impressive that the king engineers didn’t seem to have the masters (but copies of the masters!?) to achieve that! I think their philosophy is why to many ears (including mine sometimes) the king sound a bit harsher. A last comparison: The clifford brown album is in my collection both as replica 15 king AND as lexington original–my only one! To me they sound identical (apart from the ravages of time on my vg+ lex ).